Chicago police officers saw some strange things before Laquan McDonald was shot dead. Video — released more than a year after the fatal incident — shows the 17-year-old black youth jogging and then walking down the street on the city’s Southwest Side, holding a small knife by his side. Prosecutors say he was 10 feet from officer Jason Van Dyke, who fired 16 rounds. But as The Wall Street Journal reports, the initial police report contains many details that appear to describe a different reality of that same event. Mr. Van Dyke said he believed the youth “was attacking w/ knife, trying to kill” him, according to the report, and so he began to fire. In a subsequent interview, the officer described the possibility the weapon could have been a throwing knife and brought up a department bulletin warning of knives equipped to fire bullets. Van Dyke’s colleagues claimed McDonald waved his knife, according to the report, and attempted to get back up after being shot. But none of this is on the video, which shows the teenager lying in the street after being shot. McDonald is a full traffic lane from officers when he is shot. The police report’s version is not shared by prosecutors who charged officer Van Dyke with first-degree murder in November. While the charges and release of footage is recent, the killing happened in October 2014, mere months after the death of Michael Brown last summer at the hands of white police officer Darren Wilson in Ferguson, Mo. Brown’s death was not captured on video. Following that controversy and several other citizen deaths elsewhere, many — including the White House and Department of Justice — have called on law enforcement to reevaluate their use of force and their policing of minority communities. But others have complained that police have been unfairly criticized for doing a dangerous, thankless job. Force that looks bad can still be justified. 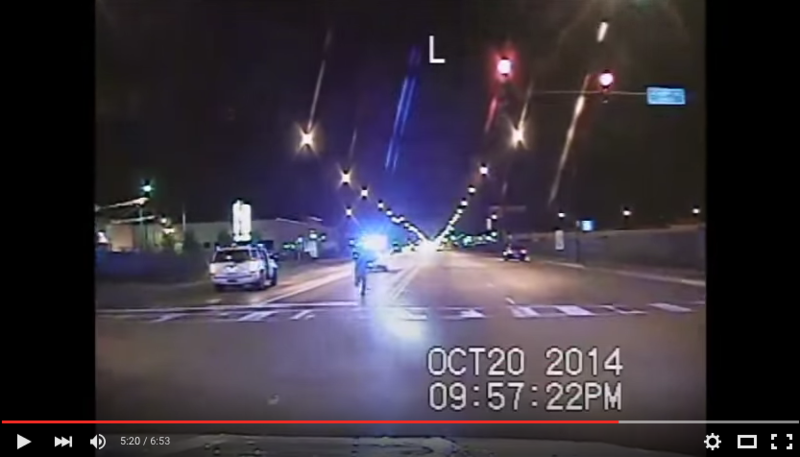 The Chicago video, however, doesn’t appear to just show police actions that look bad. It shows something that looks different from what police previously claimed to be true events. Van Dyke’s lawyer explains that his client was protecting himself and others, the Journal said. A union rep said the video is only a snapshot of an incident that involved many officers and a noncompliant citizen wielding a weapon. Surveillance footage from a nearby Burger King has apparently been lost, according to The New York Times. The Chicago Tribune reports that Van Dyke previously admitted to having copied the account of other officers in a report related to a 2005 shooting. Rather than interviewing witnesses, he matched his account of the incident to what other officers were saying. Today, the federal government announced that it would investigate the Chicago Police Department and its handling of the shooting investigation. Chicago Police Superintendent Garry McCarthy has been fired. Despite the controversy around McDonald’s death, the Marshall Project notes his work as a police reformer. Also today, the Cook County state’s attorney declined to file charges against another officer in the shooting death of Ronald Jackson on Chicago’s South Side. He was killed days before McDonald.